Simplicity in it's use and flexibility because of a stat definition table. This package contains the macro functions which are used in my spreadsheet LotroPlan for most of the calculations like calculating rating percentages from ratings, item stats from item levels (armour values for instance), LI title stats from I,II,III etc. 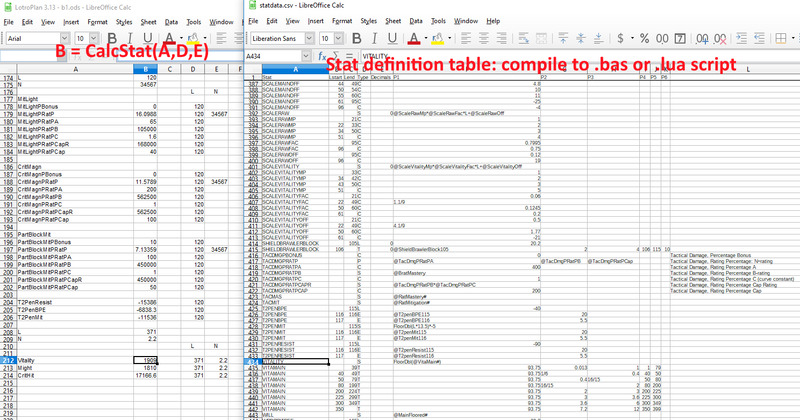 The VisualBasic script compiles statdata.csv which results in the CalcStat.lua file with the major calculation function. Statdata.csv contains currently ~1200 entries (an entry is one stat calculation segment). You can most conveniently view the .csv with a spreadsheet application. Note: most is up to date with U23, but some effects/passives might be in need of more work. Rule of thumb: if you don't see a segment in the calculation tree which starts or ends in the character level 116-130 range(no typo ) then it's likely not updated(yet). - fixed a bug in Roman number decoding for LI titles. - fixed a bug in Roman number decoding for LI titles reprisal. - implemented a binary search tree for the stats lookup. tree height/depth is 10 at the moment (max capacity 2^10=1024 stats). - some stats were added or changed(made current with BR U23.2p2) see post below. - added TpenArmour, TpenResist and TpenBPE with the new penetration calculations. N=tier, so like CalcStat("TpenArmour",120,3) for Tier 3. - added T2penArmour which is the same as the old T2penMit stat (reused in the game). Other old stats T2penResist etc are also still available. Old pen stats are used in older instances (instances without T3). Last edited by Giseldah : 12-02-2018 at 04:30 PM.